Learn how to loop array of data in React. Looping array of data is common in building web-applications. In this article, let me show you how to loop through such an array and display the details in a React.js application. For this we will use the standard create-react-app command. In your terminal issue this command: npx create-react-app display-array. 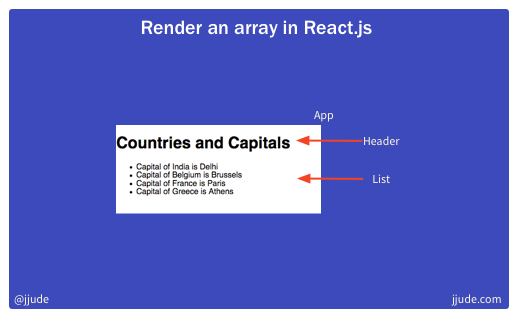 This will create a new react app in a folder display-array. You can go into the folder and start the development server with npm start. It will start the server and open the application in the default browser. We will create two components — a header component to display tittle and a list component to loop through the array and display the country and its capital. Create a new folder named components. Within it create a file Header.js. This component will only display a h1 tag. So we will create this as a stateless functional component. If you have the development server running, the app will automatically update itself. Otherwise, you can see the result by starting the development server with the command npm start.